Good morning! Happy first Monday of June! Hasn’t the weather been crazy lately? Despite the cool weather and tons of rain, I finally got around to planting my big urn. Perfect timing, since it rained again last night! Want to see how it turned out? After a long winter all that remained was a volunteer mum and a pumpkin plant. I transplanted the pumpkin and left the mum since it worked so hard to come back. Using the thriller, filler, spiller formula I planted the rest of the urn. I replaced the grass with a pink Mandevilla Vine as the “thriller”. 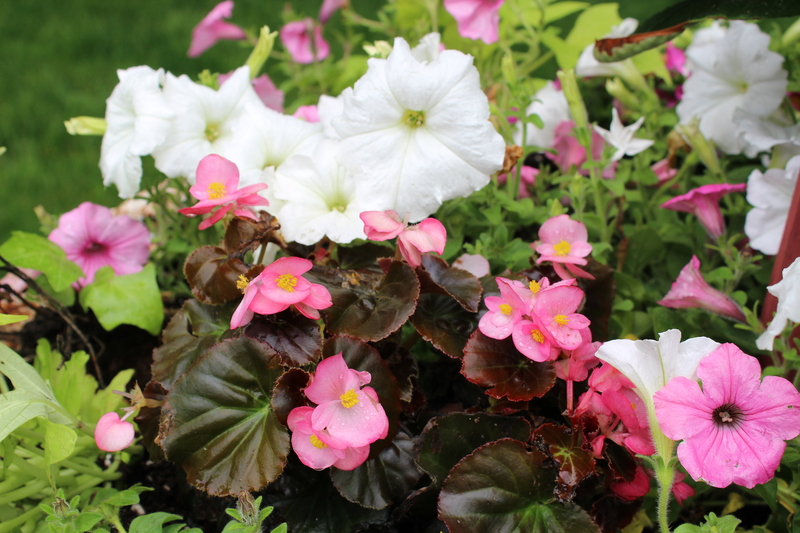 Then I added pink and white Petunias, begonias and some million bells as the filler. For the spiller I used my usual Sweet Potato Vine. There are a few volunteer ivy plants that I left in place. I love the pale green of the sweet potato vine and it seems to thrive in this spot so I end up buying some each year. Here’s how the urn looks now! How to ask someone to be your flower girl…. Hi,I check your blog named “Planting Annuals in Urns – dells daily dish” regularly.Your writing style is witty, keep doing what you’re doing! And you can look our website about تحميل اغانى شعبى.